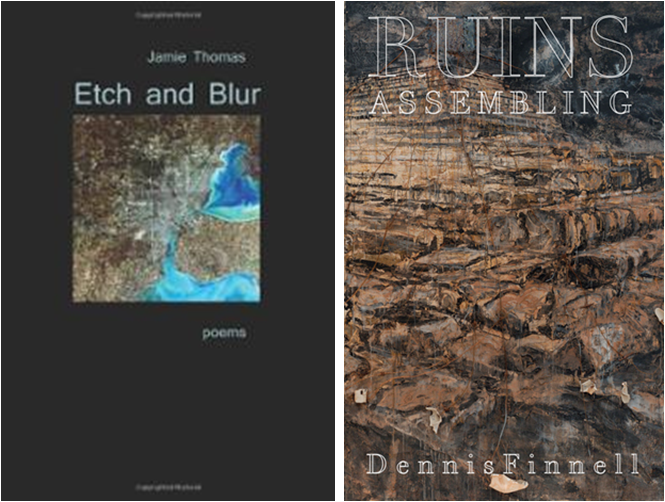 Two new books, Jamie Thomas’ Etch and Blur and Dennis Finnell’s Ruins Assembling, arrived at my house within days of each other. The occurrence isn’t in itself remarkable, but as I read the collections I kept feeling resonances between the two books in terms of theme and style. It seemed logical to review them together. I was six months old so the “we” is debatable. What’s your take on when someone becomes an “I”? endless chewing, done in remembrance of whom? nourished by that which consumes us. Humor is one of the more obvious aspects these poets have in common, though Thomas’ sense of humor is more self-deprecating than Finnell’s. Thomas turns to humor to keep his poems both lively and thoughtful. The persona behind the majority of the work in Etch and Blur is the rueful fellow who’s afraid he might be one of life’s sad sacks, but the reader can guess that persona is at least partially a blind. The speakers in these poems are full of second-guesses and wry self-reflections, observers of life’s ironies (mundane and bitter by turns) in the process of trying to see things clearly, if that were possible. Of a broken mirror and its aphoristic years of bad luck, “[t]he shardsscatter and fall in the place where you find/yourself.” Like Finnell, Thomas seems most at home writing a voice that sounds convincingly autobiographical—“this is his life—and my/summer work. My advanced degrees/are nothing on this site,/my borrowed hammer awkwardly attacking/the brick half-wall”—but Etch and Bluralso includes a number of poems in a more distant observer mode, or even in a persona that is clearly not the poet-as-narrator. I am afraid to fly; shouldn’t we be afraid to fly? Sometimes, I am afraid, at a distance. We hope the same way we hate, by smothering. Moments such as these keep Jamie Thomas’ collection from becoming too glib, too clever—and he is very funny, so it would be easy to focus on the occasionally messy, even silly, whirling asides and puns. Yet the humor doesn’t, in the end, undermine his themes. The risk works. Finnell’s humor is slightly less obvious, and darker—or merely more keenly aware of mortality—and he tends toward larger, more abstract circumspection. That is also a risk, and it also works. Both books exhibit a sly awareness of the paradox, struggle, and potential amusement inherent in the human condition. I would be happy to find such coincidences arriving in my mailbox more often.